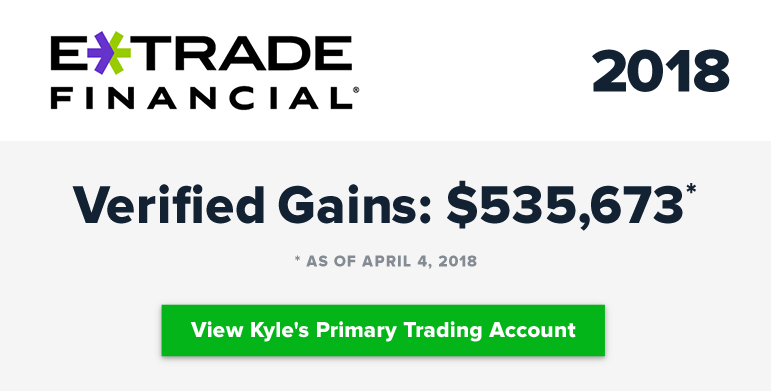 From broke college kid to trading phenom, Kyle’s trading results went from dismal to legendary after joining the Millionaire Roadmap program. 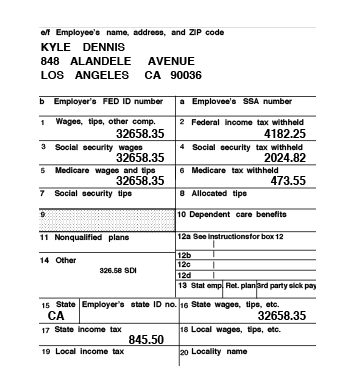 Like so many young people today, Kyle Dennis found himself carrying a heavy load of student debt after graduating from college. With the high cost of living in Los Angeles and student loans from UCLA to pay off, Kyle knew he needed to enter the workforce as soon as possible. So, even though it wasn’t in his chosen field, he took a job as a real estate analyst to get a regular paycheck, and keep the bills paid. Unfortunately, with his new job came a 60-minute commute each way, and even though having a steady paycheck was nice, it wasn’t long until Kyle started to experience what so many Americans feel. He started to feel caught in what most American adults call "The Rat Race". Just about everybody knows the drill. You get up early, rush out, sit in heavy traffic, until you get to the office where you have to submit yourself to a grumpy boss, boring meetings, and the day-to -day 9 to 5 grind. Needless to say, it wasn’t long until Kyle started to feel that he was not going anywhere in his job. He was looking for more challenge. He felt limited on the corporate career track, and honestly could not see how he could ever earn the kind of money he really wanted. Kyle thought that trading stocks might be a challenging way to pay off his student loans and grow his income in his spare time. So in 2012, he made a decision that would change his life forever. He opened a trading account with $1,000 of his hard-earned dollars. It was all the money he had at the time, but that was okay, he had taken the first, and most important step towards achieving his dream of financial independence. He started trading stocks! It wasn’t long until Kyle realized how little his time in college had prepared him for a career as a stock trader. He was facing a steep learning curve, and had very little time to research stocks properly. Because of his long commute, time limitations at his job, and limited funds, he had a hard time getting going. And because he started with a small account, the brokerage fees were cutting into his meager trading profits. "It was a real struggle to keep going at this pace. I would wake up at 5:00am, and drive to the office so I could make a couple of trades as soon as the market opened in the morning." Making matters worse, one of first stocks Kyle bought was Neurogesx (NGSX), which lost most of it’s value. He was left holding the stock and licking his wounds from the unexpected loss. It was then that he realized he needed more guidance on how to research companies, and make his trades the right way. Kyle subscribed to some free newsletters, and for about a year and a half tried to teach himself how to trades stocks. Unfortunately, his trading results were less than impressive. Then one day, while he was in a free chat room, another trader told him about an stock mentor named Jason Bond. The trader told him that Jason was very good at teaching people how to read “chart patterns”, and that he had developed a special system for taking rank beginners, and quickly turning them into successful traders. With this recommendation, Kyle immediately signed up for the free newsletter at JasonBondPicks.com. Impressed with what he saw, after a few days, he decided to become a paying member of JBP and started following Jason’s lessons on technical chart patterns. 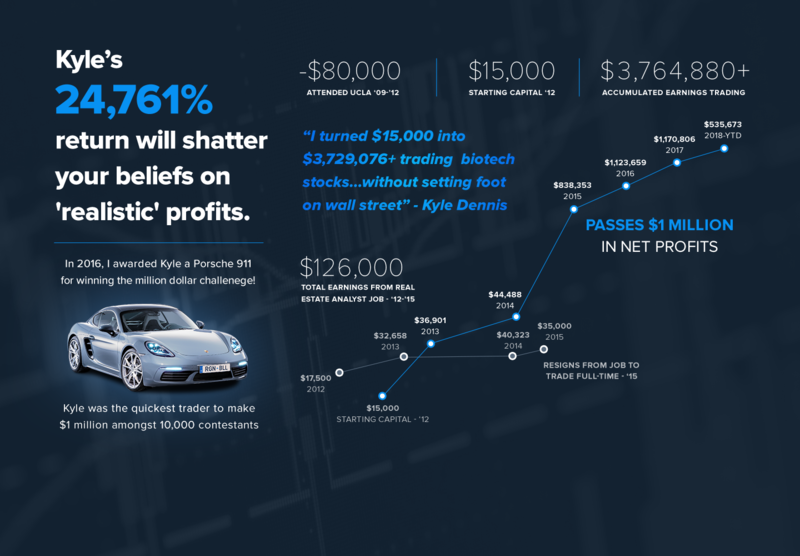 He also learned how to time his entries and exits more precisely, and it wasn’t long until he was generating from $4,000 to $5,000 in monthly profits from his part-time trading activities. He honestly felt this was pretty good money for a young guy from a middle-class family, who was fresh out of college. 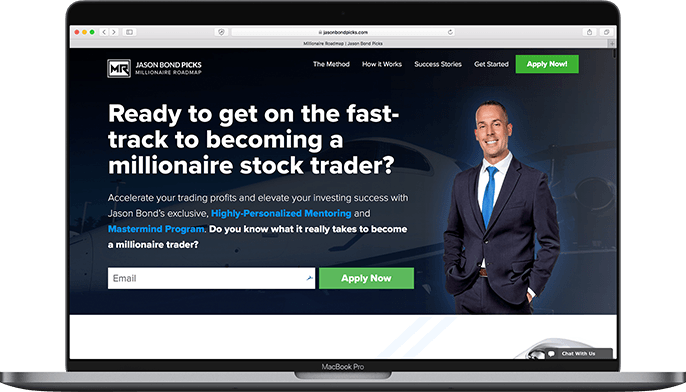 As an active member of the JBP quarterly newsletter, Kyle received an invitation to join Jason Bond’s Millionaire Roadmap, an exclusive mentorship program designed to show serious traders how to skyrocket their trading gains and maximize their profits. Kyle had always dreamed of becoming a millionaire one day, but he had doubts about whether he could achieve that level of success. 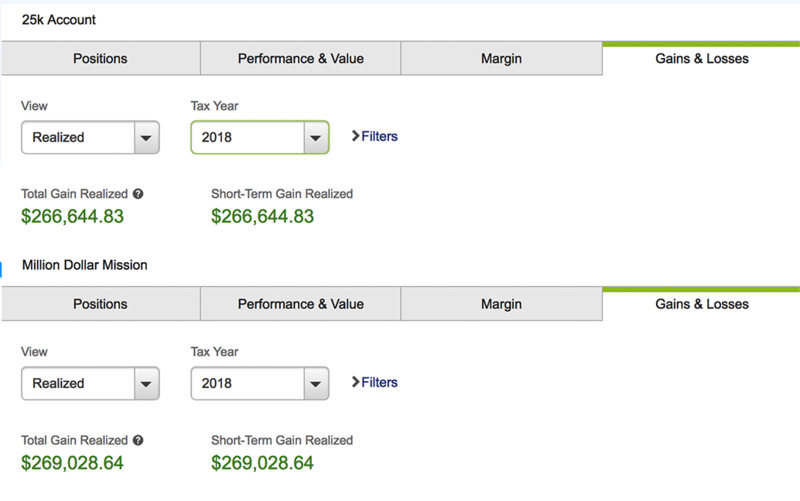 In February 2015, Kyle had $50,602 in his trading account, he joined Jason’s Millionaire Roadmap program in June of 2015, and after the first month, he had earned an extra $28,000. 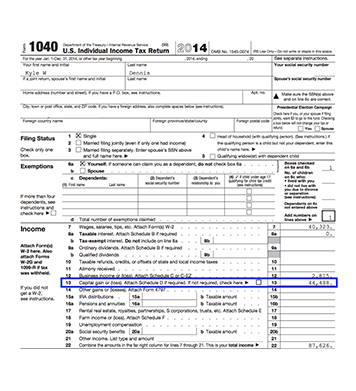 Now check this out... by the end of that same year, he had racked up $849,513 in profits. Yeah, you read that right. 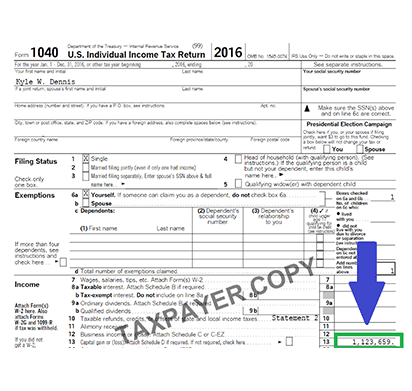 He earned an extra 850k within a 6-month period after joining MR, and by early 2016, he had generated a total of $1,075,696 in profits. 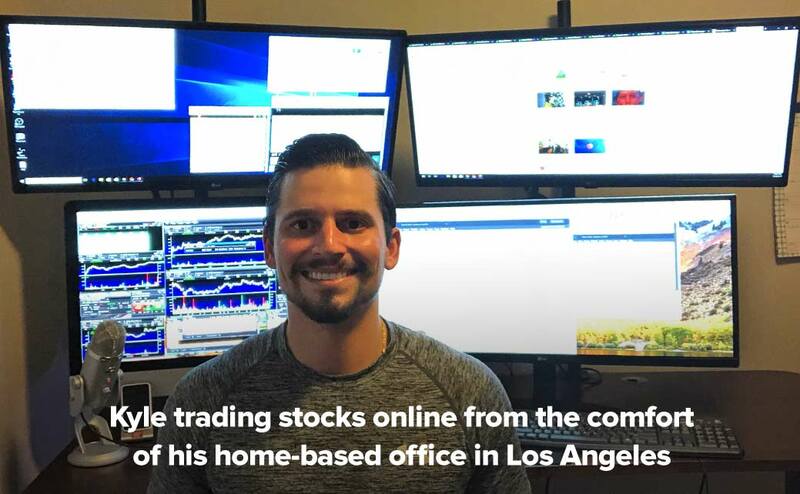 By applying the strategies and techniques he was learning, Kyle had become a self-made millionaire trading stocks online. Needless to say, with this kind of financial success, he couldn’t continue to justify the time he was spending at his regular job, so he resigned, and became a full-time stock trader working from the comfort and safety of home. Plus, he was more than happy to say “adios” to his 2-hour daily commute in heavy LA traffic. 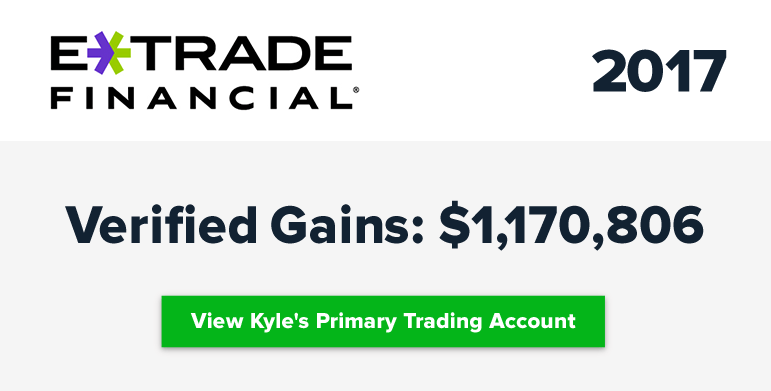 As you can see, Kyle made smart decisions along the path to becoming a self-made millionaire stock trader. He invested in his education, learned from his mistakes, was persistent, and he seeked the guidance and experienced advice he needed to achieve his goal. "For me, it was definitely worth buying MR. Look at it as an investment in yourself. Get yourself a really good education, and watch Jason’s live streams. If you think about it, the cost of the annual membership is a small price to pay to accelerate your learning, and optimize your opportunity to become a millionaire. Use it to improve your trading as soon as possible, because every day you’re missing out on excellent opportunities to cash in on the market." In goes without saying that Jason and the team here at JasonBondPicks, are very proud of what Kyle has done at such a young age. And that’s why we celebrated his success in a big way. 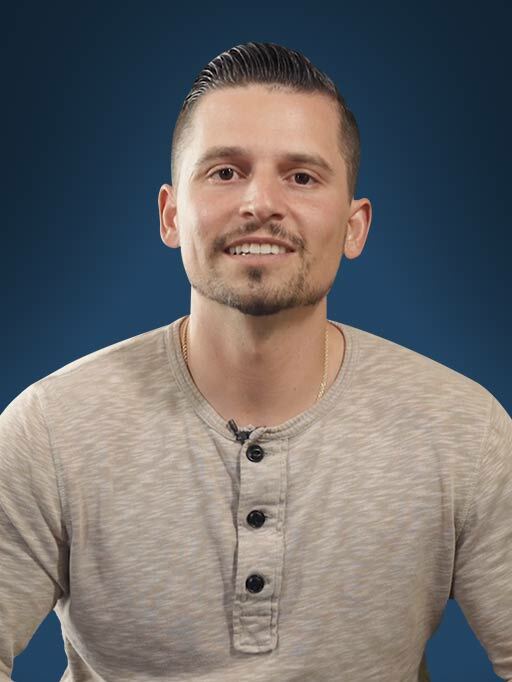 When he wrote and told us that he had generated $1,075,696 in profits as a member of Millionaire Roadmap, we invited Kyle to Las Vegas where we held a very special event to recognize his extraordinary achievement. That's right, in a room full of onlookers and reporters, Jason Bond awarded his star student with the keys to a brand new Porsche 911 Cabriolet convertible sports car. 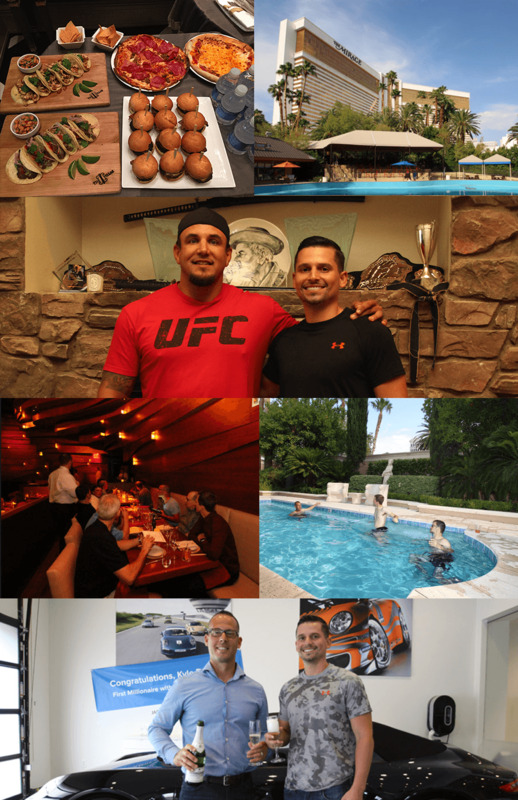 In addition to the Porsche grand prize, we organized a special celebration dinner, and even rented a private villa at the Mirage Hotel, where Kyle, Jason, and key JBP team members partied all night long. What was the party like? Well, we won't go into details, but you can check out some of the pictures below, and let your imagination do the rest. 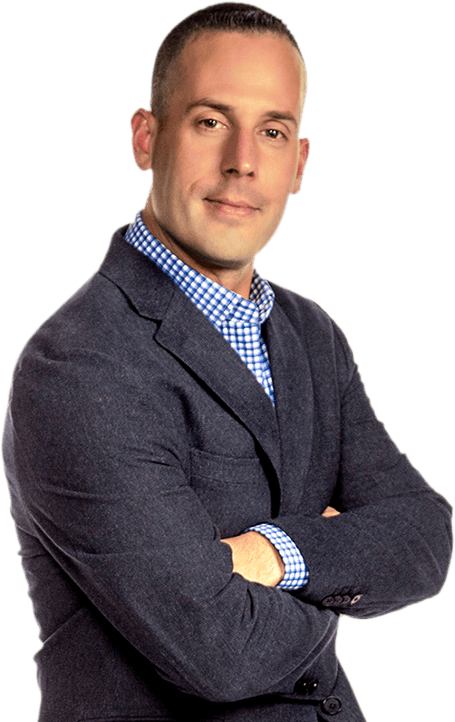 Jason, founder and CEO of JasonBondPicks.com, is a self-made millionaire trader who left the corporate grind to trade professionally. He’s trained well over 10,000 paid members and is the #1 stock trading stock advisory service TrustPilot, which is the best member review site in the world. He’s part of the trading education powerhouse, Raging Bull, and he’s been featured on Forbes, The Street, Huffington Post, Investing.com, Seeking Alpha as well as the floor of the NYSE.